I know that this is a delayed reaction of mine but after reading a lot of negative responses from several people, including the former Polish president Lech Walesa, who had won the prize in 1983 and after such responses, I couldn't refrain myself from not expressing an opinion on this decision. In fact I felt that Lech Walesa's whole argument of people in the EU getting paid to do the job to be meaningless – that is the case with most Nobel Peace Prize laureates. Some might dismiss this article as 'an article from an ill informed young and naïve foreigner' and for all you know, you may be right in doing so. I was aghast, back in 2009 when the Norwegian committee decided to award the prestigious prize to the US President Barack Obama, only because he was the president of the United States, who had been in office only for ten months, back then and had hardly achieved anything and the only thing he had done till then was that he made a lot of empty promises. At that juncture, it made me wonder about the other potential individuals / organisations who could have been given the prize and there was one very obvious candidate – European Union, an organisation who have been promoting peace in Europe for several decades, unlike Obama's ten month tenure. visa free access, a broad legal framework with minor differences in individual member states (similar to the United States), even acts as an observer for several similar regional unions and also many other aspects but for a common military. Europe could've been the epicentre of another world war yet again owing to its proximity to the Warsaw Pact countries but since the fall of the iron curtain, the former communist nations were welcomed with open arms and today, countries like Poland, Estonia among several others to the east of the iron curtain are an integral part of the European Union. There are several such regional / continental organisations and to take an example regarding such a union, I'd take SAARC (South Asian Association for Regional Cooperation), which has eight member states, with a significantly higher combined territory than that of European Union. However, SAARC, or for that matter, any other organisations haven't achieved even close to what EU has achieved and going back to the SAARC example, it is probably the most insignificant union – all countries have different currencies and it is nearly unimaginable for a national of one member state to acquire a visa of another member state, leave alone free access. This is sadly the case with nearly every other supposed regional union as well. So, to the question, whether European Union has promoted peace and democracy, the answer is obviously yes. When the Union was formed, it was less than a decade since France and Germany had been on different sides during the WW 2 but today, it is nearly unimaginable to even think about the possibility of the two nations waging a war against each other. The fact that the pre-requisite to join the Union is to fulfil the conditions of Copenhagen criteria would imply that there are certain codes in the country which uphold the values such as democracy and freedom – and many countries have done that in order to reap the benefits of being a part of the Union – a direct indication that EU has promoted peace. But for that, the Schengen agreement along with several other treaties and agreements has ensured free movement of labour, resources and capital within the Union. But for that, there are obviously several other aspects which the EU has achieved and it may not be appropriate to state them all in this article; moreover, these are the two most obvious things visible to an outsider like myself. This decision by the Nobel committee has attracted criticism mainly because of the timing of the award – at a time when Greece, Spain and some more countries are facing an economic turmoil but what people must keep in mind before making such remarks is that EU hasn't received a prize for economics, it was for peace and it is evident that they've achieved peace, over these six decades. However, to live up to its expectations on receiving this award, there must be an end to this crisis- after all, no economic crisis lasts forever; even the Great Depression was overcome, and incidentally, one of the worst-hit nations (Germany) of that depression is today a member of the Union. This is certainly a challenge for EU which is bound to be met. 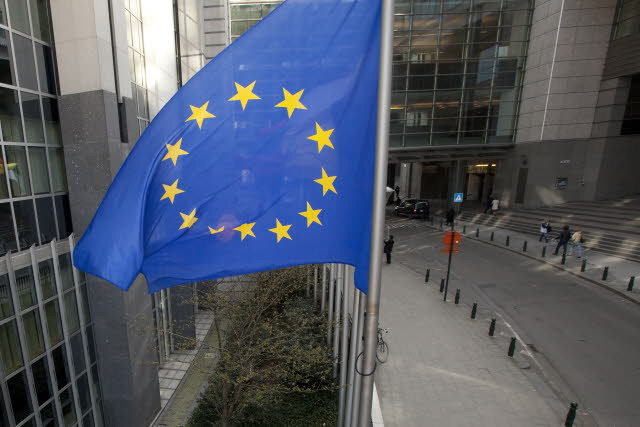 In future, I'd like to see the EU becoming a much larger union and perhaps, this may even sound Utopian, but I'd like to see the Union amassing the entire Council of Europe under one banner. It'd certainly take time and effort but it is worth doing so. I've always been an admirer of Europeans and their culture – for they've been the pioneers of most revolutionary ideas and EU is another one such idea, which has set an example for the world. 'For most seagulls, life consists simply of eating and surviving. Flying is just a means of finding food. However, Jonathan Livingston Seagull is no ordinary bird. For him, flying is life itself. Against the conventions of seagull society, he seeks to find a higher purpose and become the best at doing what he loves. I started reading this book for two main reasons: one – I'm badly lagging behind in the Goodreads reading challenge and this book being just 87 pages (of which, half of them are pictures), could help my chances of completing the target; two – the author, Richard Bach, is an American. I haven't reviewed a book written by an American author in this blog, so far. 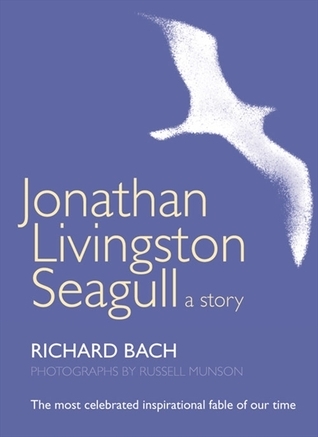 I would have definitely liked the first to be a much bigger and a far more mature novel but it is good to start this with something as simple as Jonathan Livingston Seagull: a story. I did mention two reasons, but I'd also heard about this novel several times, as a highly inspirational story and you start looking at your life from a different perspective after reading this novel. Over my four years experience, I've learnt to have my expectations low for something that is frequently praised by others since more often than not, such works of fiction have always disappointed me. But, this was rather different and I like the way it started, Jonathan Livingston, a seagull trying to break free from the chains of command of the seagull flock and follow his passion. Unlike the other seagulls for whom flight was a mere tool acquiring food, Jonathan wanted to excel in flying for that was his passion. But for the start, the story was simply bad, on all the other aspects. When I arrived at this conclusion, I wondered, at the outset whether I was the only one who was unable to appreciate this work but I was glad when I realised after reading some reviews at goodreads that most people who've read this book shared my opinion. When this was tagged as 'motivational', I expected how Jonathan would fight against the norms of the flock and in turn excel in flying overcoming the societal constraints. Instead, the author just went on describing how Jonathan flew at '190 miles per hour' which in no way was interesting and wasn't anywhere close to being inspirational. Besides that, I'm shocked to find this book stacked in the shelf 'Literature' in various bookstores and libraries whereas I'd say that this is nothing more than a standard fairy tale – the seagull is oppressed but two 'angels' take him to another world where all birds are like him, returns happily to earth and starts training like-minded seagulls. Moreover, I found it odd to give seagulls a surname – Livingston, Lynd, etcetera. I've nothing to say beyond this; a four paragraphs review is more than sufficient for a forty page novel. I didn't get any inspiration out of this story and I'm sure most people who read this book would feel the same. It is definitely one of the most overrated books I've read so far. 'Stories surround us. Stories about people like us who make difficult and often complex choices that sometimes astound us. You must have come across some people in your own life who closely resemble the characters in these stories. Maybe you have gone through trying moments in your life too. For instance, have you ever been bugged enough with your partner to want to leave? Have you ever had to choose between love and money? Have you even had to compete with your partner? Have you ever felt that your family weighs you down when it comes to choosing your partner? At times like these, haven't you wished that things happened differently that you could change how they ended? Now you will control how the stories in this book end. Each story centres on the life of an urban middle class character caught in a set of circumstances beyond his or her control. A Hindu girl living in with a Muslim boy is suddenly in the glare of global media in a reality TV show, a divorced cynical man faces the prospect of committing himself to a prostitute, a highly talented small town girl must choose between life and death. All must resolve the conflicts within their beliefs. Read the way the stories end in the book, but if you don't agree with the ending, visit the website for alternate endings. If you don't like the way the stories end there either, write your own, and if your ending is selected, see it in the next print run with your name in the acknowledgements. 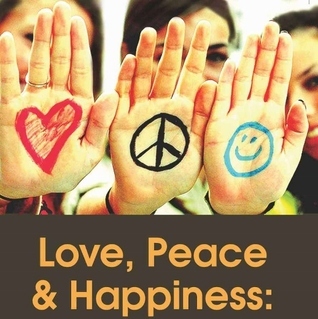 'Love, Peace and Happiness: What more can you want?' is a collection of short stories written by Rituraj Verma. All these short stories are centred around people who are seeking the three aforesaid aspects of life, that is, love, peace and happiness and are having to encounter a set of problems during the course of the journey. This book has certainly introduced a very new concept; it is easy to ruin any good story with an inappropriate ending. Hence, the author gives you two choices here – if you aren't satisfied with the ending in the book, you can go to his website and read the alternate endings. If you aren't satisfied with that either, you can submit your own, which would appear in the next edition, if approved. The stories covered the various marriage related issues in its nine stories – a simple arranged marriage owing to parental pressure, inter-caste marriage, live-in relationships, love between people from different religions among others. I also liked the way how, although it is a collection of short stories, the stories aren't independent and most characters appear in more than one story and if not appear, at least mentioned (except for Sneha, a character from the first story, A high, like heaven, or so I believe). The author also managed to successfully downplay the importance of money as being the panacea to all problems and how the above three things mentioned in the title could not be obtained by these. From what I could interpret from these stories, the author is to be appreciated for being forward thinking, something that is desperately needed in a country where the majority of people are conservative fundamentalists. This book would have been better had the characters had also been from different backgrounds – most of them were similar to that of the author himself, that is, they went to India's premier institute (for engineering), IIT and the only story where the setting was totally different was The practitioner of austerity, as story I thoroughly enjoyed. At times, I also felt that the ending was rather abrupt but regarding that, I've been given a choice to change it myself (which I shall not, since I'm a little conventional when it comes to books, retain it as it is). The main problem with this review is the person who has reviewed the book and in this case, it is I. The author had sent a book review request via e-mail a month ago but I think the author would have decided otherwise had he known a little more about me. My answers to all the questions mentioned by the publisher is unfortunately, 'no'. I'm certainly not meant to be the book's target as I'm still a teenager and I was unable to relate myself to the characters and the issues and could probably understood better by people who are in the age group of 25 and above and because of this limitation of mine, I don't think I'd be able to give a proper rating to this book. Given the option of reading the alternate endings or submitting your own, I don't think I'd do either of them, I'm willing to accept the book as it is, as aforementioned. However, I felt that all the Hanif – related stories, that is, The intimacy of space, The victim of many loves and The Facebook stalker could have been merged into a single story but I only have a control over the endings and this has its own pros and cons – you needn't have to turn the pages and there'd be a sort of continuity but at the same time, that would change the structure of the novel as such and short stories have their own merits too. I'd end my review here and readers who came here expecting a very comprehensive review, I'd just have to apologise. '”Age of Hiblisk: A Story with a Soul” is the journey of Prince William and Princess Sara, the protagonists , through the magical and spiritual worlds of Pantolis, Hiblisk, and Ikra. As their voyage unfolds, they realize the true motive behind the terror employed by the forces of Dushtt to claim supremacy over the lands of Pantolis and beyond. Every new revelation brings to light the methodical madness employed by the dark forces and secrets of Mother Nature, which have been safely guarded for ages by the various civilizations of the secret worlds. Their journey also introduces them to the divine forces that monitor the functions of the world and gives them access to legendary, mystical weapons and advanced spiritual knowledge which illuminates the flow of their understanding actions towards various aspects of life. They use the knowledge gained, to try and bring peace to their war ravaged lands and fight the ever growing might and influence of the mysterious dark forces that haunt their kingdoms. 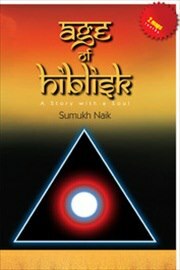 Age of Hiblish: A Story with a Soul is a novel written by the Sumukh Naik, a HR professional turned author. This is his first novel although it might come as a surprise to some who have read the book without knowing that as the book hardly showed any characteristics similar to that of one written by a callow author. To say something about this book in a few words is, it is nearly a standard fantasy novel with a good mix of adventure and philosophy, a prince and princess fighting against an evil plot threatening the very existence of their world, well written along with nicely constructed dialogues. The story revolves around three worlds; Pantolis, Hiblisk and Ikra with Pantolis being the land inhabited by normal humans but for a few shamans and members of the order who ensure the smooth functioning of Pantolis whereas Hiblisk is a world of diverse magical creatures with unknown secrets and several unexplored lands and Ikra is an illusionary world. The story begins in the world of Pantolis where in the border of the two quarrelling kingdoms of Jaguar and Ivory, weird incidents are taking place, trees turning black, a plague spreading and houses along with the people in it vanishing without a trace. The matter is brought to the prince of Jaguar, William who decides to help the village but in turn, gets trapped by the forces of Ivory while evacuating the villagers and gets forced into an unconditional surrender. It was found out by the Eleventh Master, the chief of the Order that the person who was helping the Kingdom of Ivory was in fact, Dushtt, the son of his close friend Ratraa, the lord of the underworld. The Eleventh Master helps the prince escape the dungeons of Ivory along with his subjects and also, Princess Sara, the princess of the Kingdom of Ivory, a member of the Ivorian royalty against the conflict on Jaguar. The Eleventh Master understands that William and Sara are two people with a pure heart and noble intentions and are people whom he can trust and blesses them with magical powers for their battle against the evil forces of Dushtt and sends them to the world of Hiblisk, in order to prepare them for the battle which would decide the future of Pantolis. A really good thing that I liked about the way in which the author presented the story was that it was to the point, with hardly any digressions from the main plot although there was a lot of scope for it, such as, although there was a prince and princess carrying on a task together, no pages or chapters were wasted on romance, something for which the author ought to be appreciated. Elaborating on my other point about the perfect mix, there was an adventure, like in the case of any fantasy novel but with it, philosophy was also involved, and on several occasions, the author sounded like a philosopher more than a story teller, very interesting philosophies on nature and the balance between good and evil, on women, the duties of good people, etcetera, indeed making it a story with a soul; although, personally I may not agree with some of them regarding the limits which science shouldn't cross but it would be best if I refrain from bringing in my personal beliefs into a review. The history of Pantolis and Hiblisk was also well narrated and to help the reader to keep track of the places, the publisher has so generously provided the maps of both Hiblisk and Pantolis and not to mention, the most important aspect of any book, the plot or the story too, was really good, although some might feel that the philosophical element to it was rather boring, I felt it was very much necessary (though I hardly felt that it was boring). A good plot when it is written well would be add more flavour to it and that is the case with this book, barring a few errors some of them caused due to oversight and some inexcusable phrases such as using few with the meaning of some and without using an article and also, very frequent usage of the phrase 'comprises of'. It was also rather different, rather than focussing on the conventional battles of 'goodies vs baddies', it approached the whole task in a different manner with a lot of twists and turns; certainly a combination which any reader would look forward to. The author constantly reiterates that the good aspects and evil aspects go hand in hand although the degree may vary and that happens to be the case even in the real world, including his book. To start off, the names were weird, really weird. Probably, at first the author planned a global audience for the book initially and the initial names were all sounding European (Pantolis sounded Greek to me) and if not, not Indian, to say the least, with names such as William, Sara, Pedro, Philip, Aaron, etcetera but eventually, distances were being measured in yojanas (ancient Indian unit of measuring distance, approximately equal to 5-8 miles) and suddenly a 'Captain Sharma' popping in and after around the 50th page, most names appearing were Indian. However, there is nothing so negative about this as it doesn't affect the story in anyway and after all, what is in a name? The end too was rather abrupt but the way in which ended, I could only assume that the author is probably only planning a sequel. Another problem is, personally, I'm unable to categorise the novel, although I'm not sure whether it is because of my incompetence or by virtue of its nature since I'd certainly not say that it would appeal to all the young adults because of the excessive amount philosophy involved although it wouldn't be seen as a hindrance to anyone who is interested in it or looks forward to learning such things and at the same time, being a fantasy, I'm not sure how this could be termed as a fully adult novel but if I've to choose one, I'd go for the former. I think I can close this review here with the comment that it was really an enjoyable experience reading it and with all eyes being on the Shiva Trilogy right now in India for fantasy, I feel this too, deserves some attention. Since I felt that this book was really more than just good, I'd gladly award a rating of eight.